So I have to admit a few things here. I originally started this blog to share the healthier versions of recipes that I was creating and cooking. I used to follow a loose paleo/primal style food plan with room for exceptions. I also used to take pride in discovering and figuring out different ways of creating similar tasting foods to your standard favorites without trading for a gluten-free store purchased version of the same thing (think cauliflower pizza crust vs. store brought pizza crust with alternative flours). This blog has sort of evolved (or devolved) into something else and my eating habits have slowly but surely gone back to the ways they used to be. I’ve also, without realizing, decreased my activity. The combination of indulging on a more frequent basis with less physical activity has led me back down a road I had hoped to never find myself on again. I’ve gained a portion of my weight back, but fortunately it hasn’t brought friends yet. Sure, I’m not happy about putting weight back on, but I’ve taken a good hard look at my eating habits and I’m making adjustments again. Today I started a new meal plan to help me get back on track and ultimately down to my goal weight. It won’t be easy, but I know that I have good people on my side that I can lean on and help me along the way. If you’re curious about what I’m doing about weight loss, I’m happy to discuss it. Just not right now in this moment. I’d like to spend more time figuring out how this program works before I begin writing about it. Expect a post in the future that explains the system a little bit more. Fret not though! I’ll still post recipes! I still have to cook for the rest of my family that isn’t necessarily taking the exact same journey as I am. Just expect a lot more stuff that fits in with my new food plan. These meals will be focused on lean proteins and low carb vegetables. And of course there will still be recipes for fun stuff that I won’t necessarily eat while on this food plan. 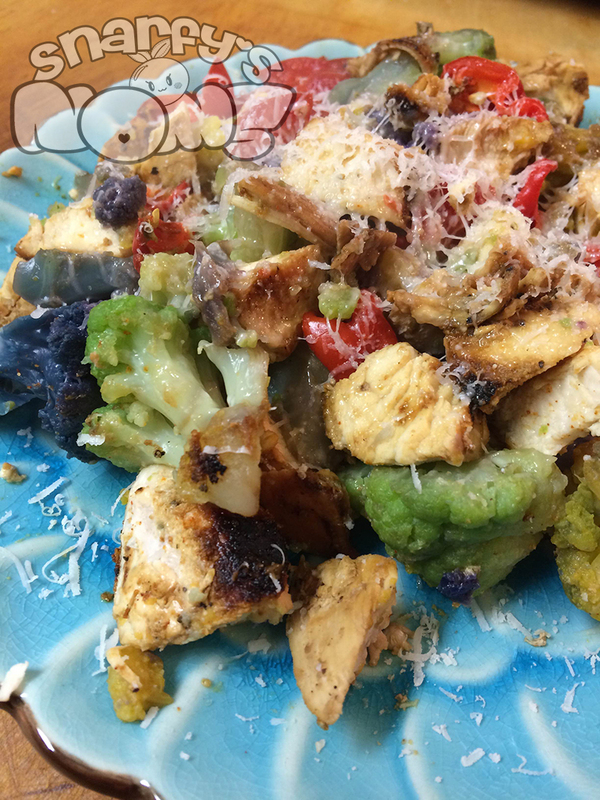 But just take a look at what I had for dinner tonight, which was chicken breast, various colored cauliflower, tomatoes, and some peppers. I topped it all off with a touch of pecorino romano for flavor. And you know what? This was incredibly satisfying even though it wasn’t bread-y and pasta-y and covered in sauce and cheese.